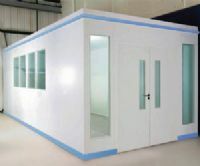 A comprehensive range of partitioning systems to suit both medium and heavy duty applications. Designed for fast easy installation, the introduction of bi-element construction gives the end user a rapid on-site assembly without lengthy lead-in times. Safety is a key feature of this system. It has been thoroughly tested and offers 30 minute fire resistance to BS476 part 22, 1987, on full height single and double glazing elevations. This also applies to door modules and solid elevations, regardless of the board joint details. Acoustics is another major performance consideration. Solid construction offers sound attenuation values of up to -42db (Rw) under laboratory conditions. 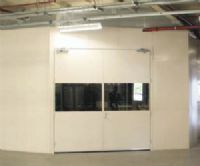 Fire & Sound has been tested to BS476 part 22 and offers up to 60 minutes fire resistance in full height glazed, solid and door elevations. Insulation performance is available on solid elevations only. Where acoustic performance is a consideration, the system can provide sound attenuation values of up to 52db(Rw) under laboratory test conditions. Standard module size is 1200mm. 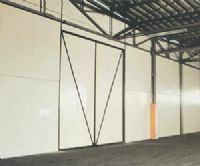 maximum construction height is determined by the choice of stud size and panel type, however, 102mm Fire & Sound can be built up to a height of 4200mm. Venetian blinds can be accommodated within the system as can a range of electrical swithches with the use of a cable management post. Doors are available in natural wood finishes, including Ash, Koto, Oak, Cherry, Beech, Maple and Sapele. 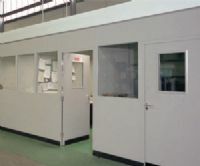 All doors can include any shape or size of vision panel or lipping. To compliment Fire & Sound, a wide choice of door furniture in a variety of finishes is also available.